My mother’s side of the family is from Trinidad. Even if you can’t locate Trinidad on a map, know this: Trinidadians love to eat. What nation doesn’t, really? Regardless, visits to my maternal grandmother (Nanny) always revolve around food. Although her narrow house spans many floors, inevitably foot traffic at family gatherings is always highest around the kitchen because at their core, these get-togethers are a celebration of family and food. It’s perhaps not unsurprising then that when I think back on childhood moments of time spent with my Nanny, these too have food at their core. I think of being an awkward pre-teen and spending the weekend with her to learn some of her trademark dishes, the ones she could never write down because she does everything by touch and by taste; the only way to learn these recipes was by making them, so I sunk up to my elbows in flour as I attempted to learn the nuances of pows (homemade stuffed breads, like a Chinese bao) and pastels (like a Mexican tamale). I learned just how much okra to add to a pot of callaloo (a spinach stew) to make it thick but not slimy, and how long the pig tails needed to simmer—low and slow—so that their sweet meat easily parted from the bone and gave flavor to the stew. I’ve never been to Trinidad, but I know the flavors of the island well, these dishes transporting me thousands of miles away long before I had my first passport. My other favorite memories with my Nanny are of the hours we would spend watching cooking shows together. Snuggled up under the covers (we didn’t even have basic cable at home, so it was incredibly decadent to me that she had a television in her bedroom), we would watch old episodes of The Galloping Gourmet, Two Fat Ladies, The French Chef, and The Urban Peasant. 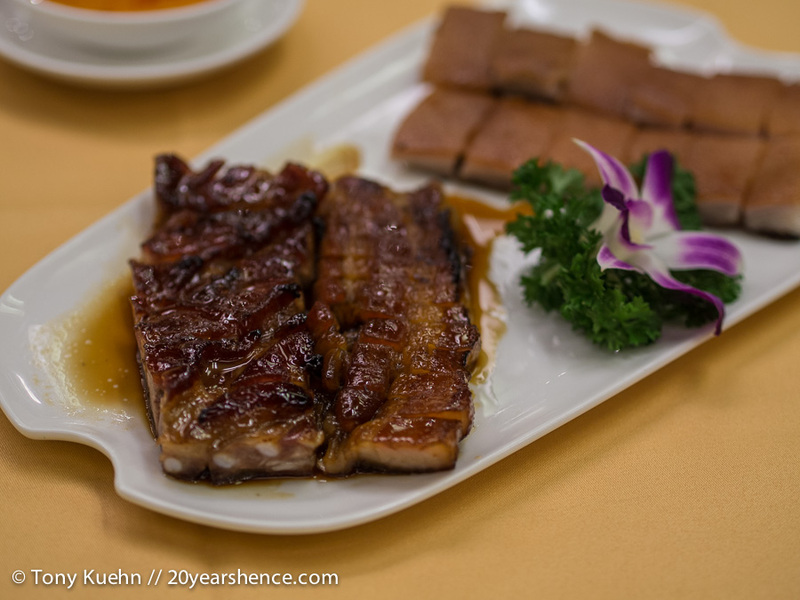 All of those were good fun, but by far our favorite show was Yan Can Cook starring Martin Yan. Nanny’s husband, my grandfather, was Chinese, so it made sense she would have a soft spot for Chef Yan’s jokes and his blazing hot wok. 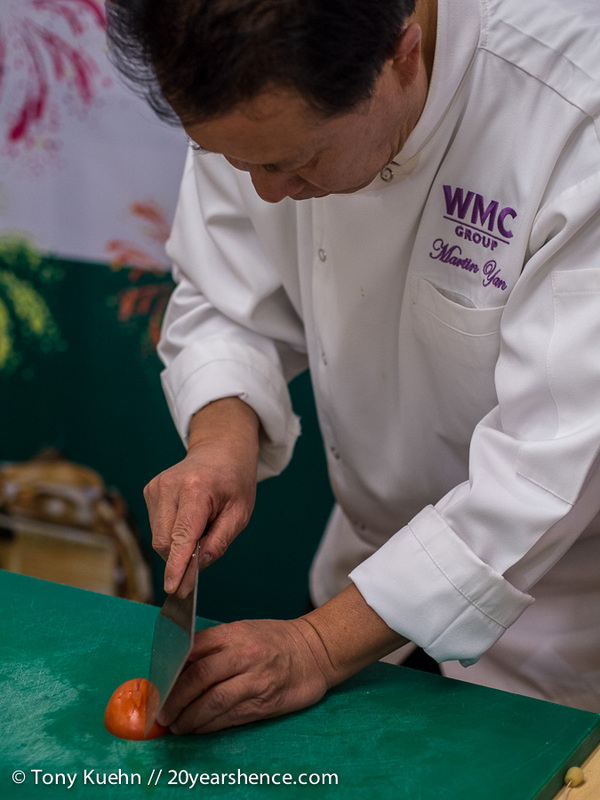 I mostly remember being mesmerized by his lightning fast, impeccably precise, knife work; I wouldn’t say I’m a slouch in the kitchen, yet despite years of practice, my knife skills are nowhere close to what Yan could pull off, quite literally, with his eyes closed. The guy was like a culinary ninja. Fast-forward 20 years, give or take, to Ho Chi Minh City, Vietnam—about as far away from Nanny’s house as I can imagine. It’s the last place on the planet that I would expect to trigger all of these memories, but a phone call from our friend James from Fly, Icarus, Fly has managed to do just that. 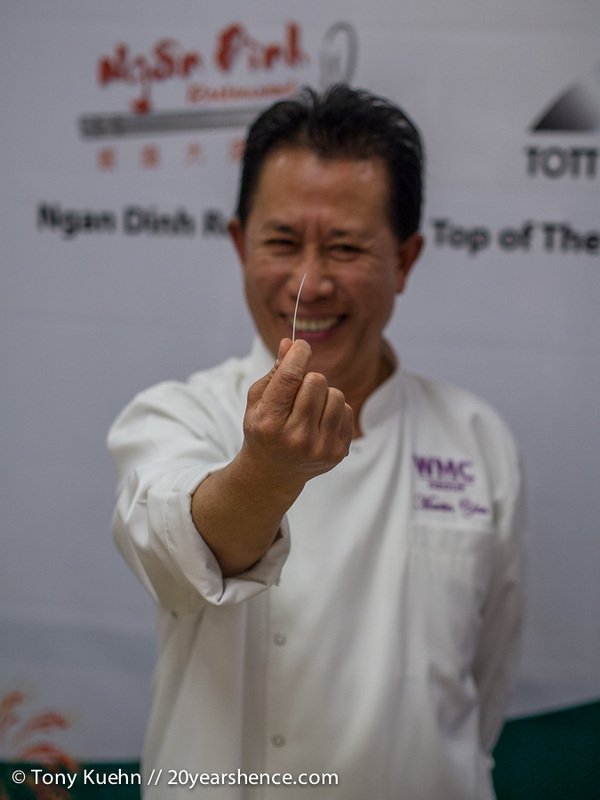 Martin Yan is in town and is doing a cooking demonstration at the Windsor Plaza Hotel, where he has been consulting and revamping the menu of their Cantonese restaurant, Ngan Dinh. James is interviewing Chef Yan the following day and, benevolent guy that he is, invites me to tag along. 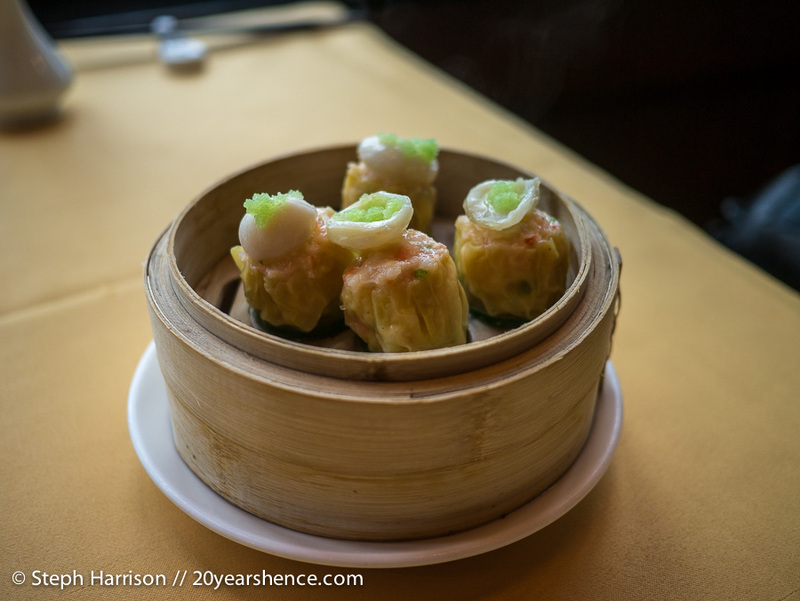 As if meeting a childhood idol and culinary juggernaut isn’t enough, he sweetens the deal by adding that we’ll also get to lunch on a sumptuous dim sum spread conceived by Yan himself. The following morning, I am far too nervous to eat breakfast because, quite honestly, I feel as though I’ve swallowed a rabble of butterflies. I’ve done nothing to prepare for our meeting and hope that if I manage to simply show up with an appetite it will be enough. 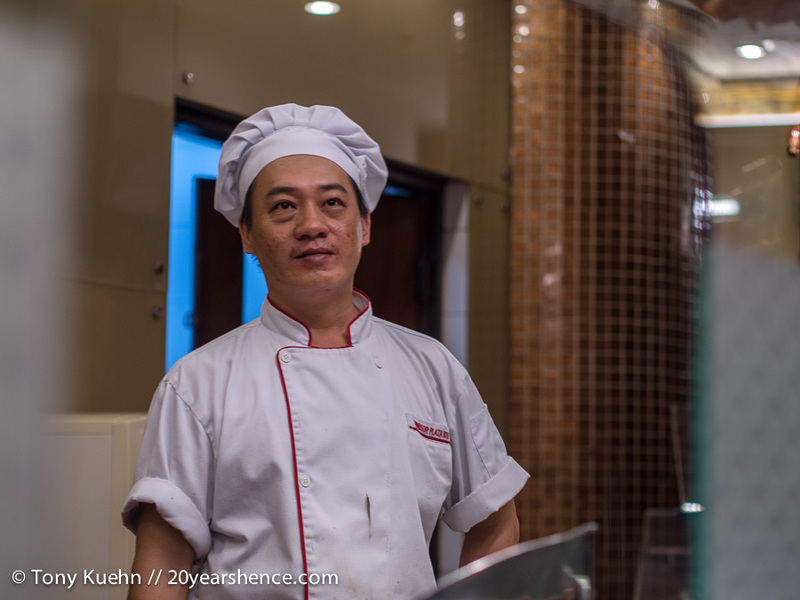 If you’ve ever watched one of Chef Yan’s cooking shows, you’ll know he’s a guy who radiates energy and enthusiasm. What you might not know is that it’s not an act or a persona that he turns on for the cameras—that’s legitimately who he is. I think it must be impossible to be tense and anxious around him because he’s exudes such warmth and good will. He has one of those radiant smiles that is infectious; you see it mirrored on the faces of all the people near him, so it’s no mystery that when we enter Ngan Dinh, he’s positively mobbed by fans who want to shake his hand and take a picture with him. Even though lunch and our interview is waiting, he makes sure that every person who wants a photograph gets one, much to the chagrin of the staff who have carefully scheduled his day. As he walks toward us, I feel my nerves dissipate and I know everything will be just fine. And everything is fine. More than fine, really. 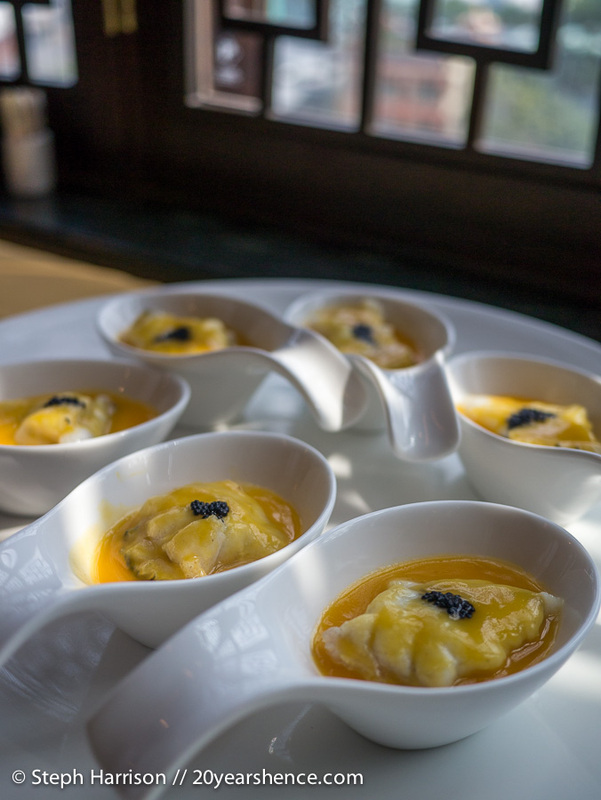 As servers swarm about to set up the dishes and make sure everything is perfectly plated for photographs, Chef Yan chats about his recent travels through Vietnam and his work with the WMC Group. He has recently wrapped up filming a new 26-episode television program, Martin – Taste of Vietnam, a project that has seen him travel from the north to the south of the country, through 15 different provinces. 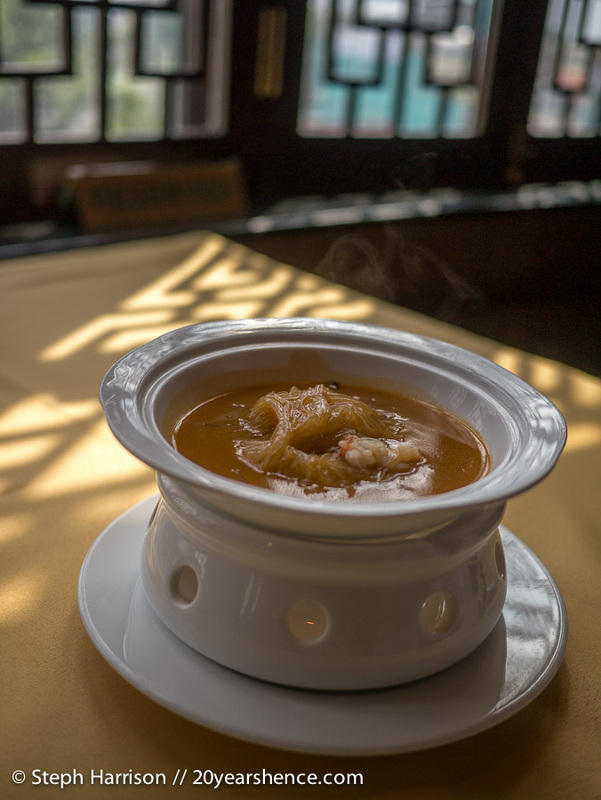 The program is his attempt to help demystify Vietnam and promote its cuisine to a wider audience; Chef Yan hopes he can do for Vietnamese culture and cooking what he did so many years ago for Chinese food when people were just starting to get curious about the food he grew up with. At that time, most people thought chow mein and chop suey was all there was to Chinese food, just as today all most people know about Vietnamese food is pho. 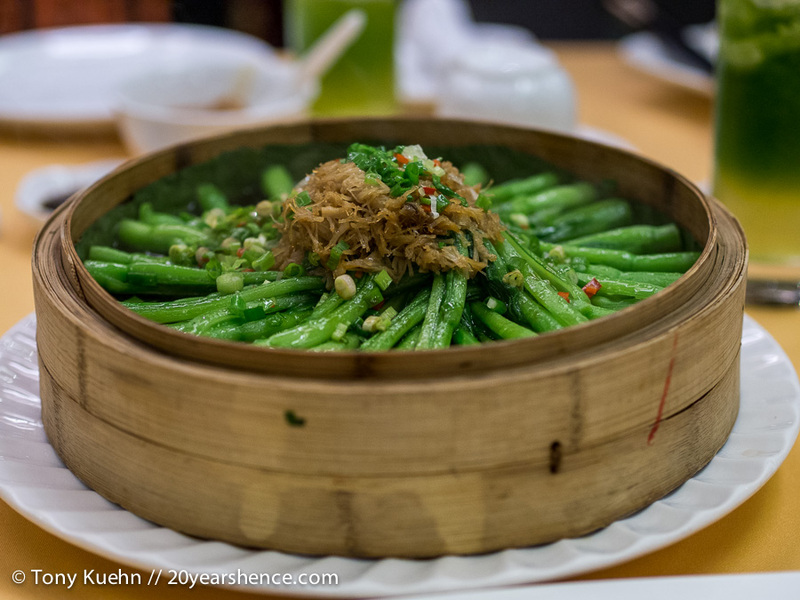 But as Chef Yan discovered, there is so much more to find and devour in this long, skinny country. 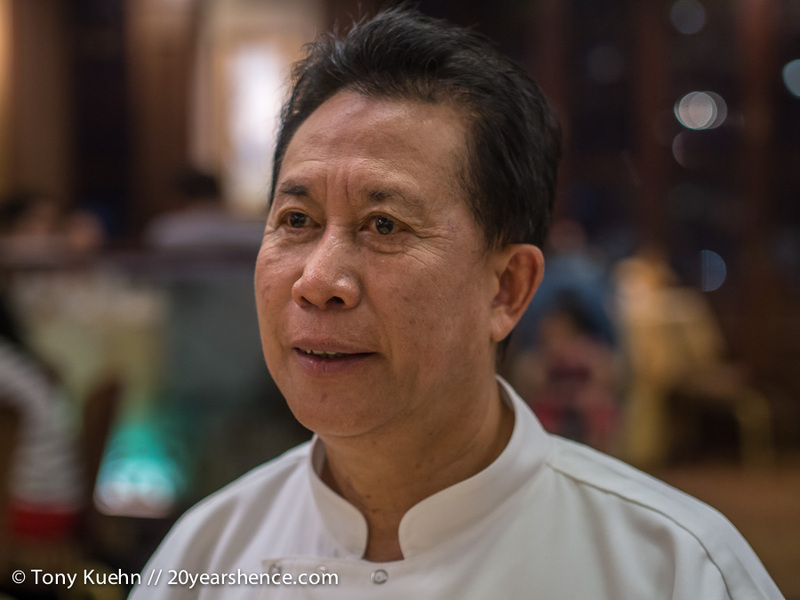 With no single Vietnamese chef popular or prominent in western media, Chef Yan wants to be its ambassador and hopes his program can bridge this chasm. To that end, his show will showcase not just dishes from the various regions he visited, but will also highlight cultural attractions and offer insight into the traditions and heritage of the people who live there. 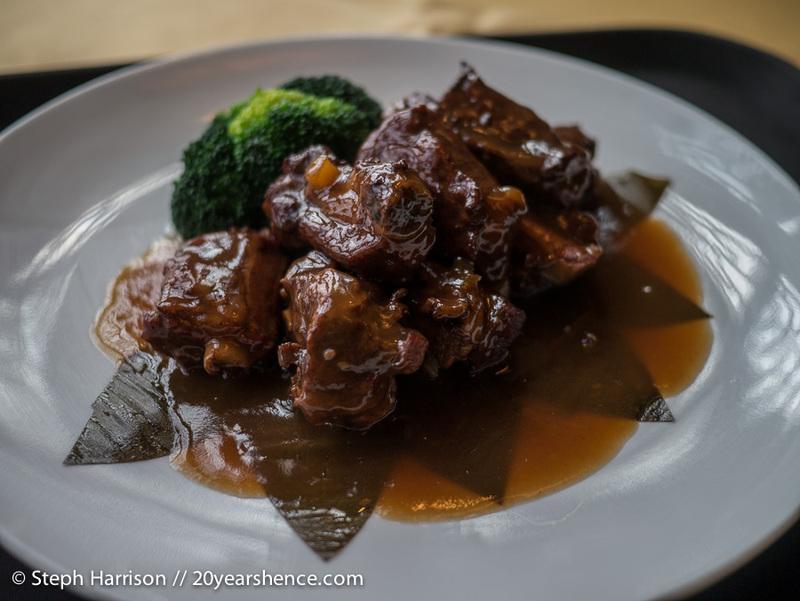 He shares that in Asia, cooking is very much a lifestyle and every moment, like Chinese New Year (or its equivalent, Tết, in Vietnam), is about food and family. His goal when he makes these television shows is the same as when he steps into the kitchen to cook: to bring people together and tell a story. 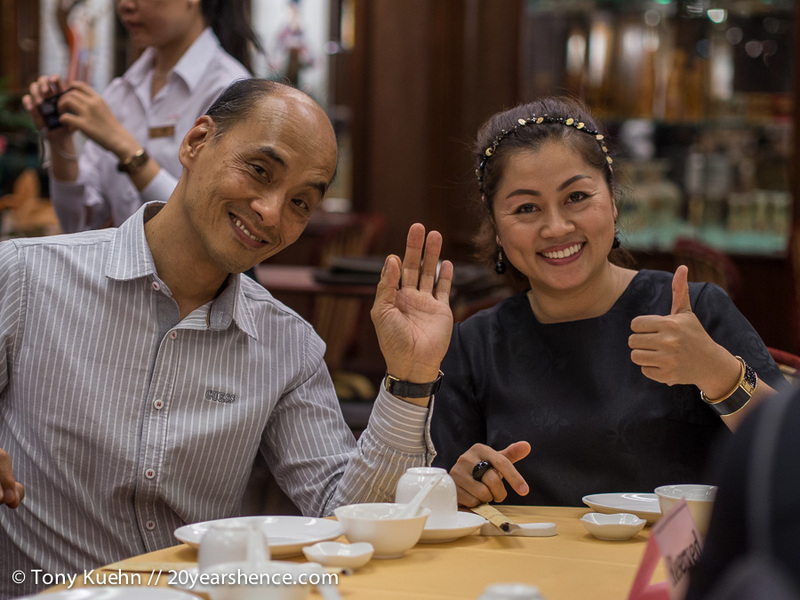 When it comes to Vietnam, it’s clear the story in question is a romance; like myself, Chef Yan has clearly tumbled head over heels for this country. That generosity and real joy for life extends to the food, he believes. 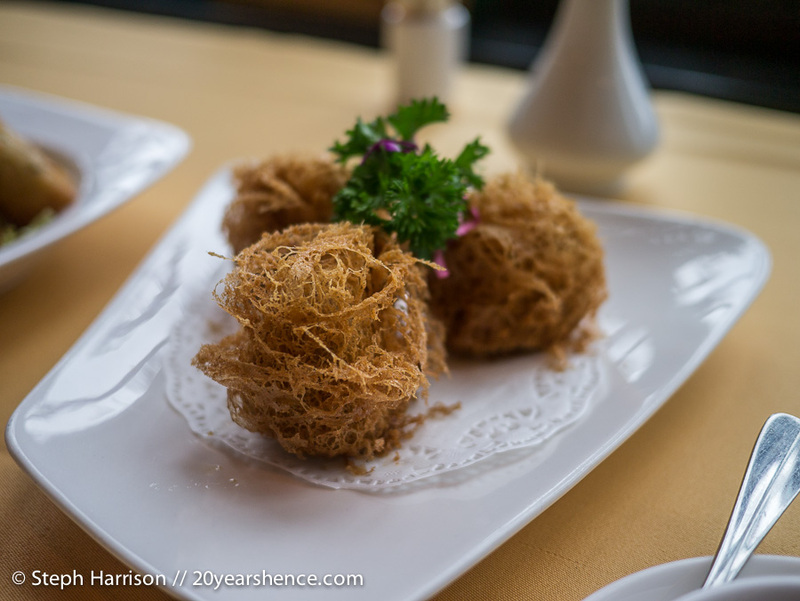 He really appreciates the Vietnamese ingenuity behind dishes like com tam, which translated, means “broken rice”. It uses the bits of rice that have shattered during the milling process and would otherwise be unusable and instead turns nothing it into something delicious. 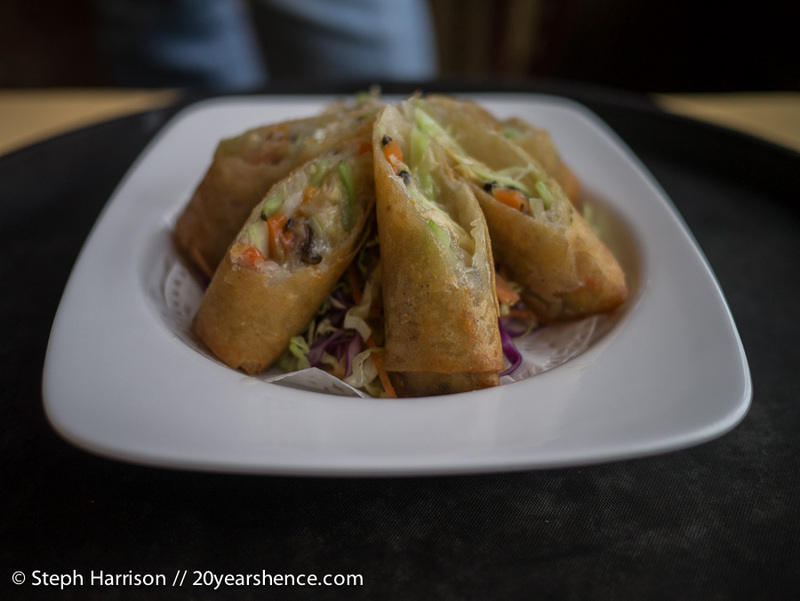 Chef Yan clearly has mountains of respect for the humble stall owners and street vendors—these are the people from whom he wants to learn, because, in his opinion, they are the best experts on Vietnamese food that the country has. His eyes dance with excitement as he talks about the success here of the single-dish restaurant, how a person can make an entire living out of cooking just one kind of soup. The reason they succeed, he says, is because they are the best at what they do. Some of them have spent decades making just that one dish and so they have become experts. I ask him which Vietnamese dishes have become his favorites. He maintains that he loves com tam, but some new discoveries for him on this trip that he’s really excited about are the salads—specifically pomelo and papaya—and (another of my favorites), banh xeo, large crispy turmeric-infused crêpes that you can toss any conceivable filling into, whether it’s pork and shrimp or sprouts and mushrooms. 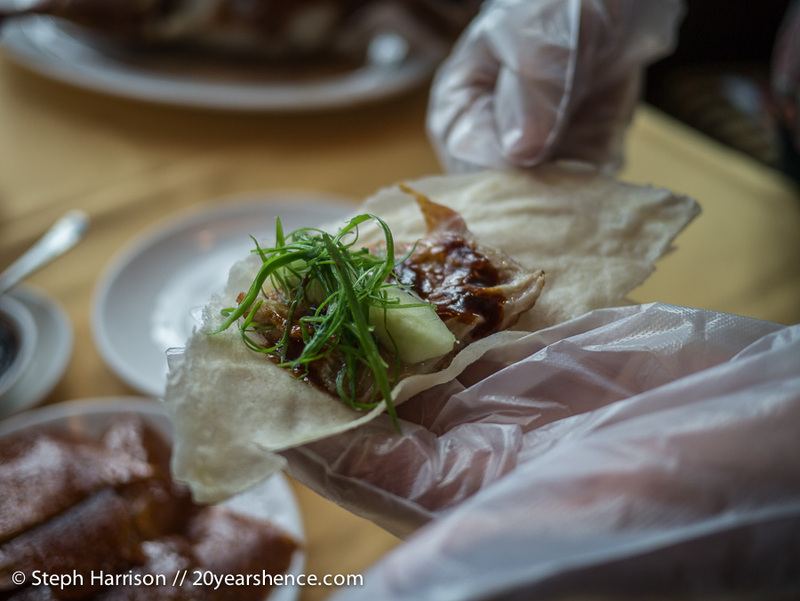 If Chef Yan’s warmth and enthusiasm weren’t enough to do the trick, all this talk of food has gotten my stomach grumbling. 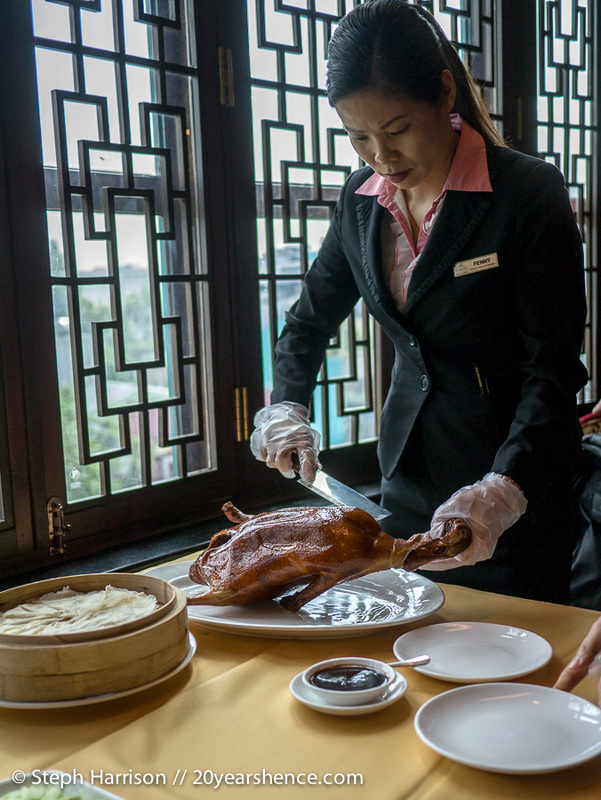 Thankfully, everyone else at the table seems to be equally ready to feast, so we start digging into the many steamer baskets and platters that are steadily accruing on the table. Bellies full and satisfied grins on all of our faces, a quick check of our watches tells us that our time is almost up as Chef Yan’s afternoon is booked solid. Not willing to let the fun end here, however, he encourages us to return that evening as his guest to enjoy dinner and watch the fun cooking demo he will be putting on. It hardly feels right to impose upon his hospitality, but Julia, the Windsor Plaza’s marketing manager, insists that we absolutely must come back and each bring a guest. After a round of photos, Chef Yan gives each of us the top knife from his signature line, promising us that they will have us chopping like a pro in the kitchen in no time. It’s certainly a memorable parting gift, though I am already wondering how exactly I’ll be able to explain this one away the next time I’m at airport security. That evening, I make my way back to the Windsor, this time with Tony in tow (poor guy had to sit out the lunch festivities); I am still so full from our lunchtime extravagance that I make Tony promise that he will eat enough for the both of us. He assures me that will not be a problem, and if the feast is anything like what we experienced at lunch, I don’t doubt it either. We are both a little tentative when we approach the restaurant as I begin to worry that the dinner offer was not really one we were meant to take seriously and we’ll wind up looking like a bunch of chumps. Once again, my fears are for naught: Julia spots as soon as we enter and eagerly ushers us over to the table—front row center for the demo—that she has reserved for us. There is a buzz of excitement in the air leading up to Chef Yan taking the stage; by the time he is ready to start, the room is packed with fans eager to see a master at work. When he finally does step behind his wok and begins prepping his veggies, julienning and dicing at lightning speed, the entire room is under his spell. 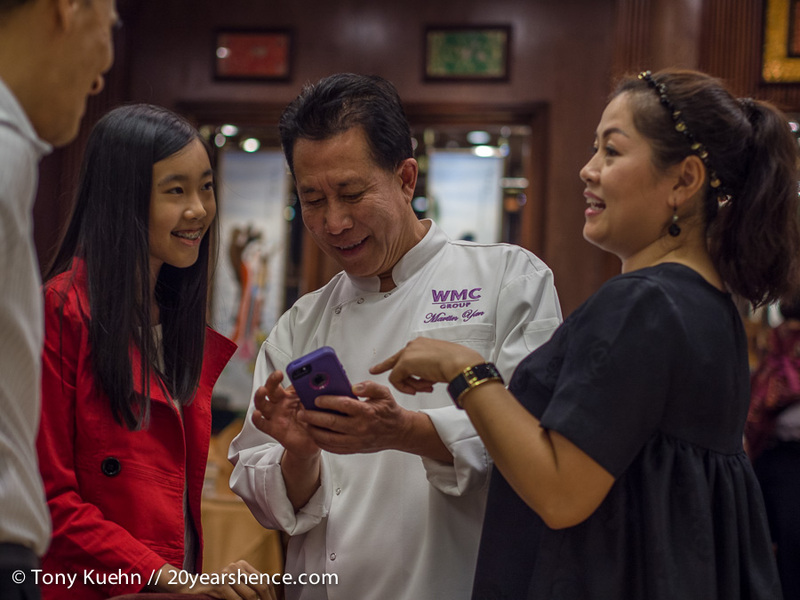 Chef Yan is completely in his element—he’s not just a chef, an educator, or a personality, he’s a performer too. For the second time in as many days, I am transported back to my childhood—I feel like am eight years old, and the act of making food is not just fun, but a kind of magic in its own right. The rapt gazes that track Chef Yan as he commands the attention of the whole room assure me that I am not alone in this feeling. 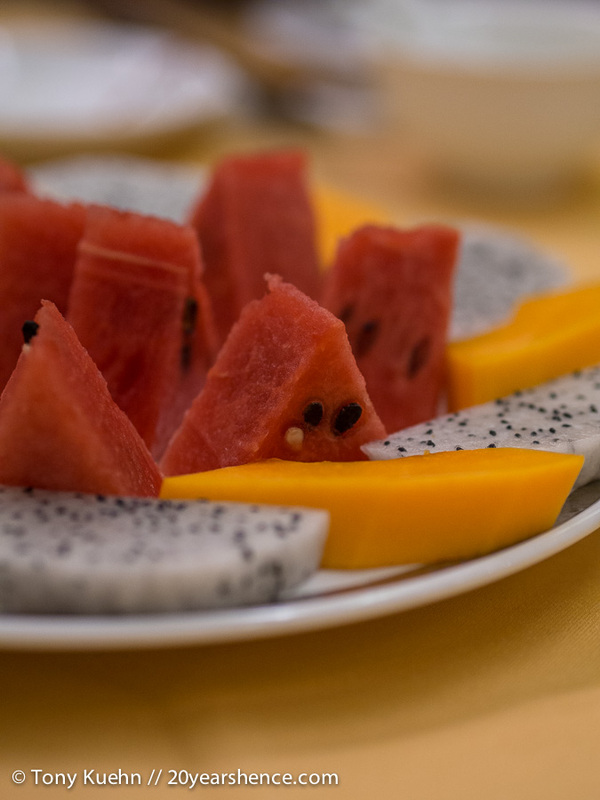 And for dessert, a platter of local fruits and a chewy glutinous rice pancake that was wok fried and filled with nuts and sesame seeds. The thing about great food is that it’s not just the flavors or the ingredients that make it special, but the stories and the memories it helps us share with other people. Even if you sit down to a meal with a group of strangers, when the food is good, it bonds you together and you part feeling like a family. One thing I’ve learned on the road is that you never know when or where memories from home will find you. It’s not always easy to be so far from our friends and family, but every so often, we have days like this when I feel like I could look to my left and find my Nanny sitting right there, taking part in this crazy adventure along with me even though I know she’s really in Toronto, in all likelihood whipping up something delicious in her kitchen. 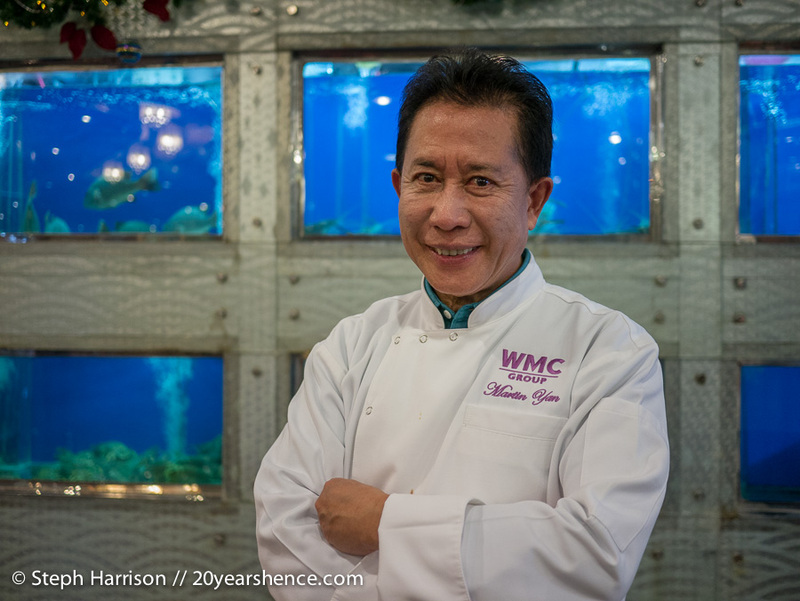 Oceans apart , I’ll always be grateful to Martin Yan for not just the two excellent meals and his excellent conversation, but for helping my Nanny find me half a world away in Ho Chi Minh City. *Footnote 1: As avid divers, you all know that Tony and I are both huge proponents of protecting our oceans and promoting sustainable aqua and agriculture. Save for our one gaffe in Xi’an, we refrain from ordering or eating shark because we believe doing so is ecologically irresponsible. 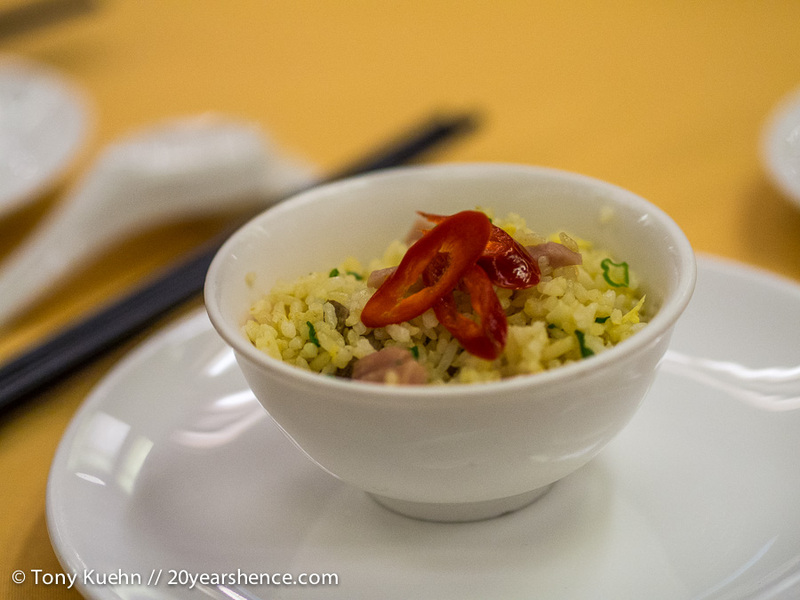 Because I was a guest of Ngan Dinh and Chef Yan, I did partake in this dish as it had already been prepared and served, and I did not see what abstaining would accomplish other than risking offense (also, I’m a people pleaser). 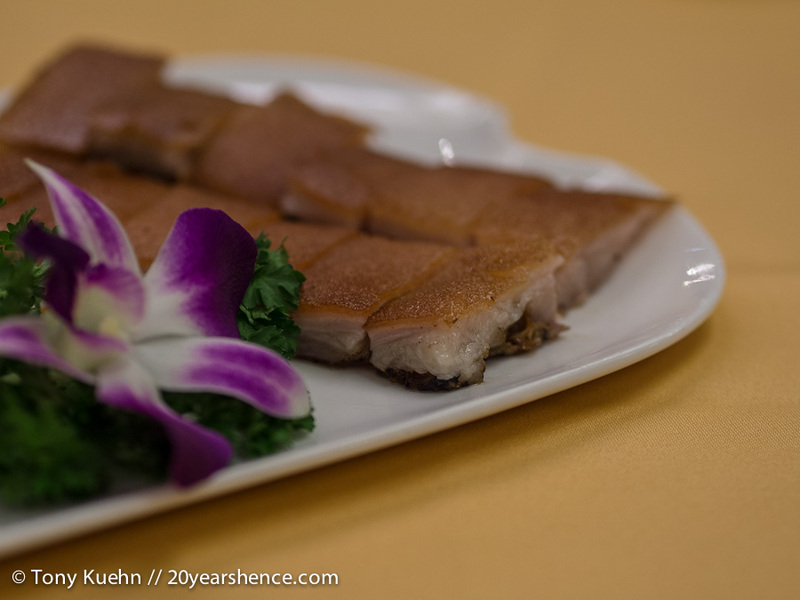 I did, however, ask Chef Yan about his views on using endangered/at risk ingredients in traditional cuisine, especially in Asia where the growing middle class and increased wealth means that things like sharks fin are more attainable by greater numbers, though no less desirable. 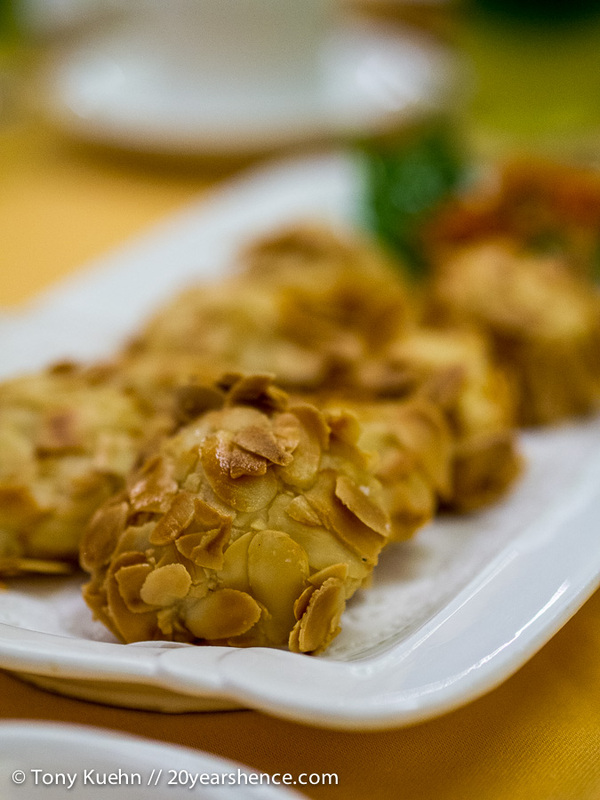 He responded that, unfortunately, it is true that things like shark’s fin are highly prized and have a traditional component to them (it has long been included at wedding banquets, for instance) that is difficult to override. However, he did add that part of his job as a consultant is to draw a restaurant’s attention to switching to more sustainable options, particularly when it comes to seafood, and substituting these instead. 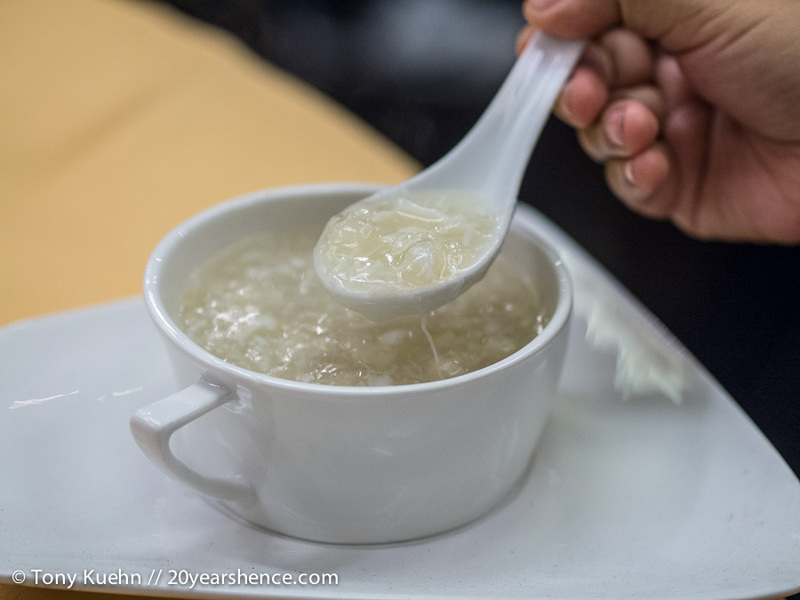 I didn’t feel like this entirely addressed my issue of shark’s fin being used in the bisque, nor did Chef Yan state what alternative to it could be suggested, but for the sake of my conscience, I had to ask. 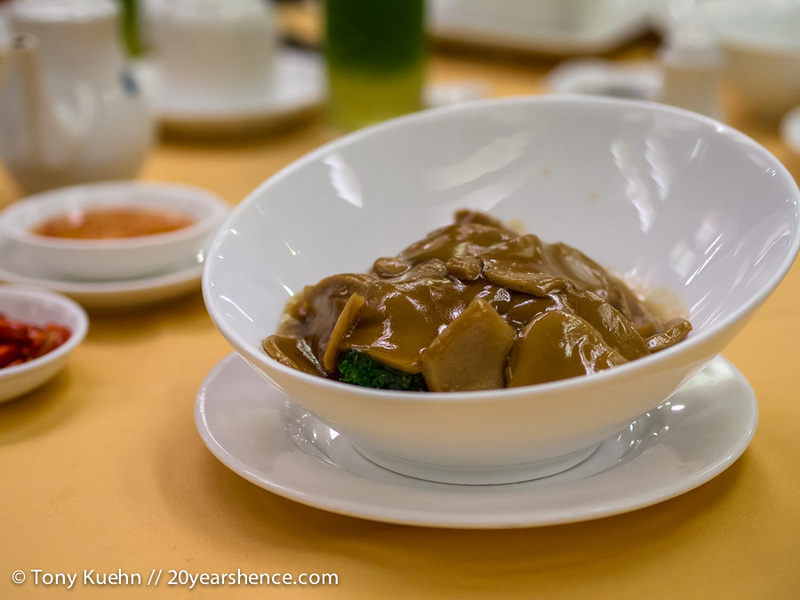 I think it would be fantastic if more restaurants and chefs took a stand regarding shark’s fin and refused to prepare or serve it, but in Asia, that’s still very much a pipe dream. However, hopefully people continuing to question the necessity and responsibility of certain ingredients and dishes will cause this dialogue to remain open and move us toward improved sustainability with respect to dining. Tell Us: Who is your favorite celebrity chef? 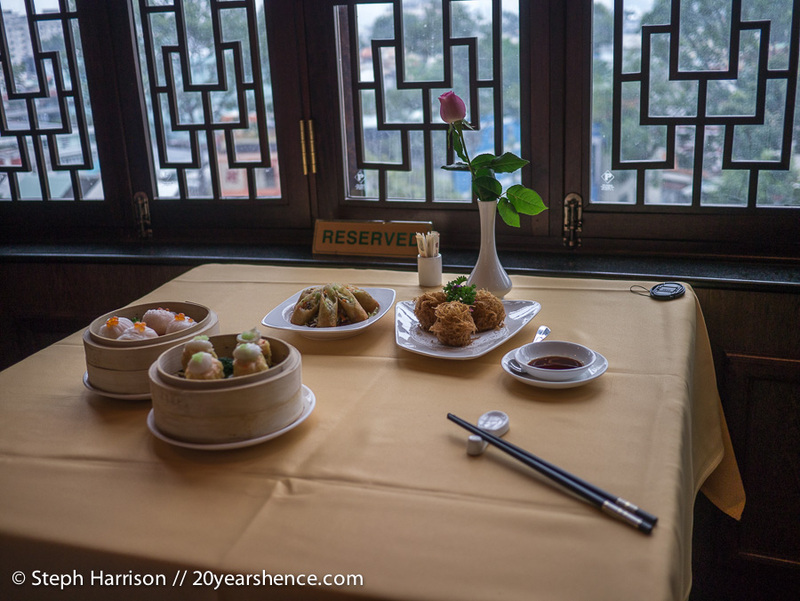 Have you ever dined at one of his or her restaurants? 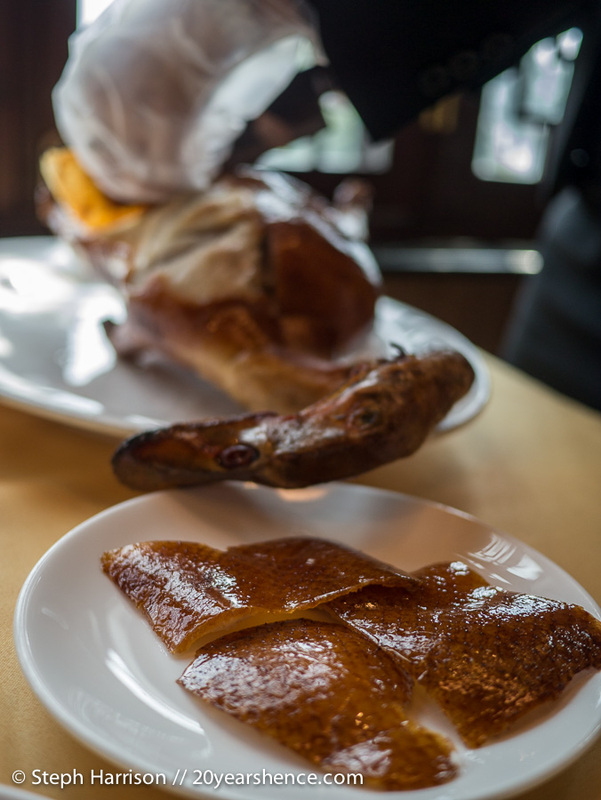 Which of these dishes would you most like to try? Also, in the near future, we will be writing a post covering all the details about living in Saigon as a digital nomad where we’ll cover our expenses and any other topics we think might be of interest/relevant. If you have a specific question about this that you would like to make sure we address, please Contact Us and we’ll be sure to cover it in the post (and give you credit for it)! Disclaimer: We’ve had a lot of wonderful adventures on this trip, most of them completely unexpected and the result of serendipity. 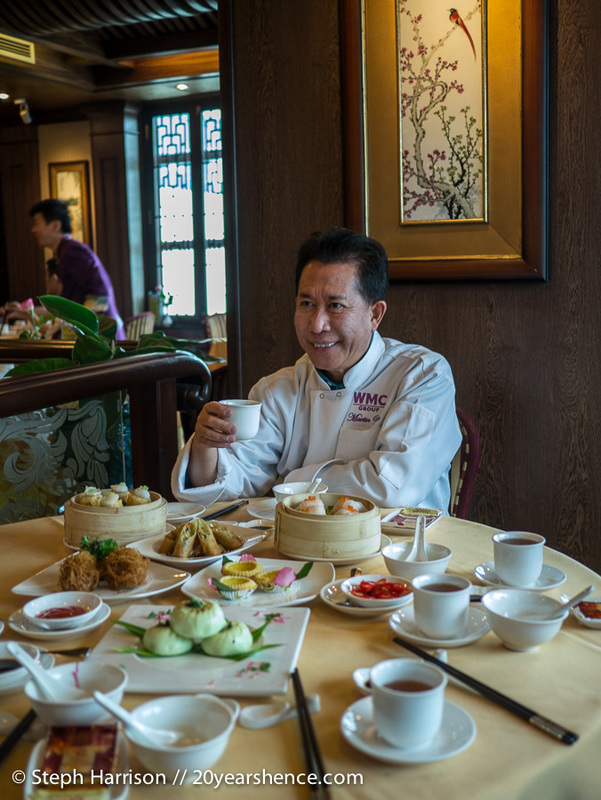 Our day spent eating and chatting with Martin Yan certainly ranks up there with the best of them. Thank you to James & Oi Vietnam for letting me tag along on his lunchtime interview, to Chef Yan for his time and kindness, to Julia of the Windsor Plaza Hotel for arranging such a wonderful day. My lunch and both of our dinners were provided free of charge by the hotel and the WMC Group, but all opinions and childhood memories are entirely my own. Truthfully, at no point was I asked to write about my experiences on this day; it was just so special, I wanted to share it with all of you. WOW that’s incredible! So jealous! I remember watching his show as a kid on daytime TV. Such a funny bugger! I love that you guys refrain from eating shark due to moral and ecological concerns. Kudos for that. 🙂 Also, I’m not a huge foodie unless you count chocolate and cupcakes, but these photographs are gorgeous! Lisa from Lulu’s Big Adventure recently posted..Project Pangia Travel Bracelets – Giveaway!! Ha ha! Cupcakes & chocolate totally count. 🙂 Glad you enjoyed the photos and that you are pro-shark conservation as well! Trisha recently posted..Comment on A dash of spring by Steffie F. WHAT!?! I AM SO JEALOUS!!! I had a Yan Can Cook cookbook with my University era rice steamer and it was my go-to for me during my studies. I love Yan and can’t believe you got to meet and mingle with him AND eat delicious food! Ack! Sounds like you really are a Yan fan! Although I’m sorry you couldn’t be there, I’m glad I could share the experience with you here and can report back that he is just as cool in person as you would think! Oh my…. what an extraordinary day!! Meeting a star chef who happens to be someone you’ve admired since childhood..!! wonder of wonders. AND, you got to eat amazing food all day. 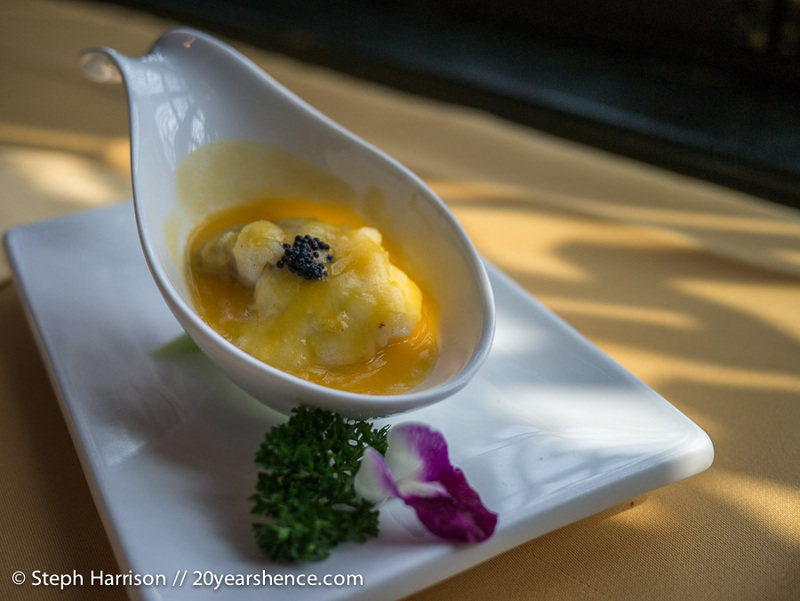 Galloping Gourmet, Two Fat Ladies, lol, brings back such memories of cooking shows from my past as well. Wow, what a wonderful experience, Steph! So glad you got to meet one of your culinary heros and eat these amazing meals! And you are so great to have questioned him about the sustainability of his choices, that was something we struggled with last week we were in Japan. Seeing threatened species like bluefin tuna (not to mention whale meat!) in the market was hard. We didn’t buy the bluefin but were offered a plate of it by a fishmonger who I had just photographed so we didn’t turn it down, though we tried to choose more sustainable options for the things we purchased ourselves. It’s a really hard issue to debate as it (rightly, or not) gets wrapped up in culture and economic arguments. Who knew eating could be so challenging, right? It’s so hard to stick to your guns in terms of abstaining from a particular food when you know that refusing it might be perceived as an insult or a value judgment. Tony & I don’t fault locals for eating what they do, but we feel like knowing what we do, there are certain foods that we just aren’t comfortable eating. I have no interest in eating whale or really any other endangered species, but in this situation, I felt the right thing to do was accept it graciously but then raise the issue of sustainability. Oh my God, the food looks so perfect to me. I love the way it is presented to everyone! 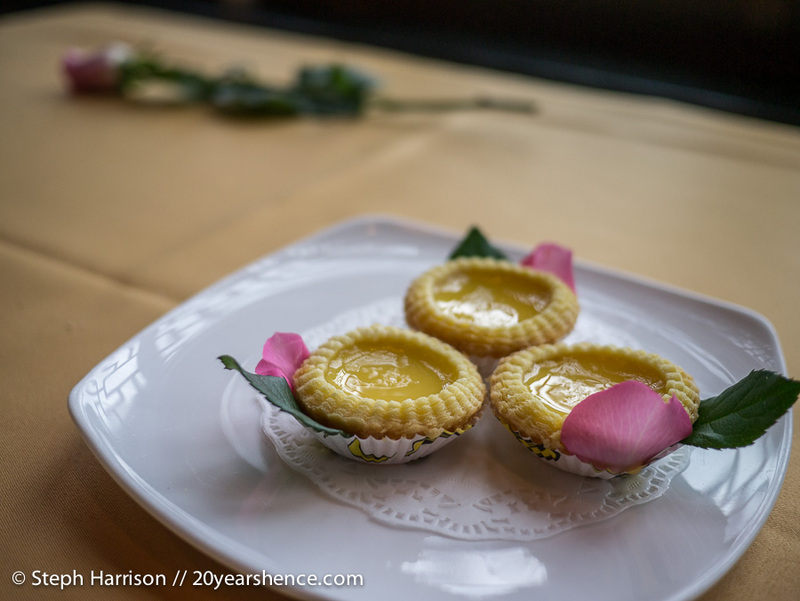 These are my favourite dumplings I keep craving when in China and I bet these custard egg tarts were extremely yummy and crunchy! 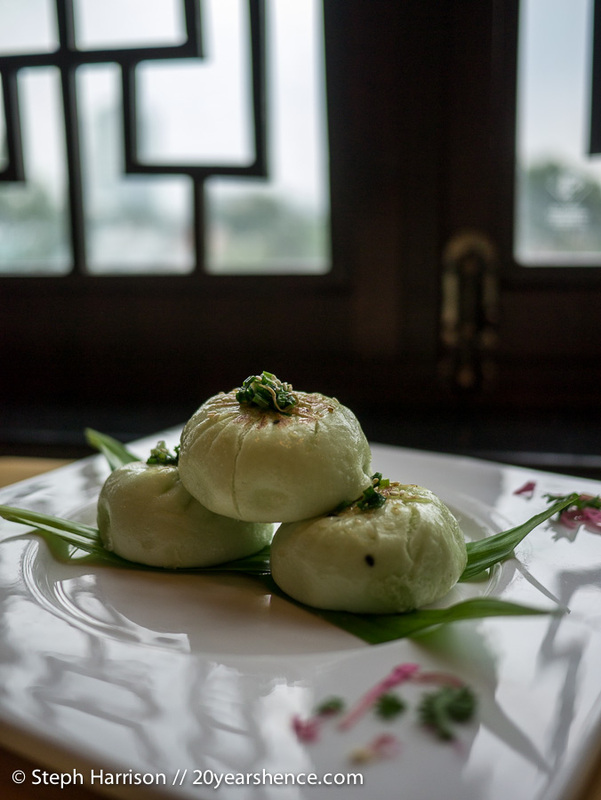 I really love dumplings too, and they are the one thing that is definitely missing from Vietnamese food. So this was definitely a welcome change of pace and soooo good! So glad you enjoyed it! 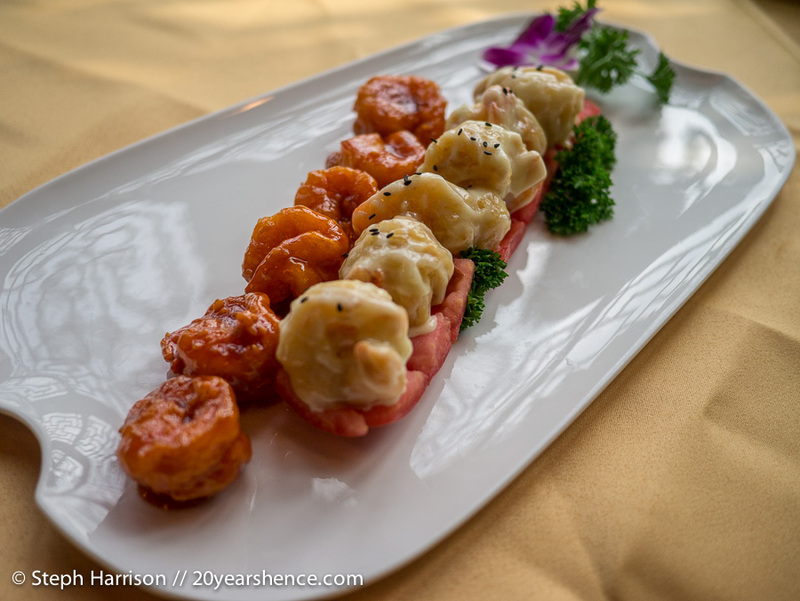 I really wish I could go back and eat both of these meals again… they were fabulous! Anyway, how exciting that you get to meet your favorite celebrity chef! What an honor must it have been for you to try his dishes and to talk to him. Those dishes look heavenly. 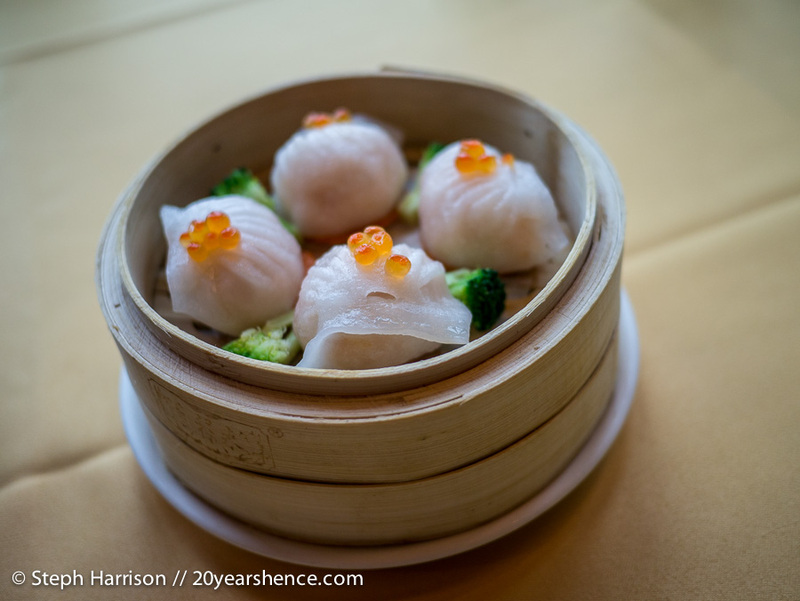 I applaud Chef Yan for ecological awareness and switching to sustainable options. You know, I didn’t actually eat very many Doubles when I was growing up (I don’t know why…) but I did discover them the last time I was in T.O. when I was craving West Indian food and they are delicious! 😀 Thanks for sending that link for your friend’s movie-once our internet is good enough, I’m definitely going to check it out. I love cooking and travel shows, so it was really cool to meet Yan and hear all about his upcoming Vietnam travel show. I’m so glad you enjoyed this post… I think we’re all drooling over this one! I just love fortuitous full-circle stories like this. Warms the heart. It’s so cool that you got to meet a television personality you grew up watching and that the experience brought you back to such a special time with your grandmother. It’s also nice to read that he is such a nice guy! I would love to be a fly on the wall at that airport screening interview. Haha… oh lordy. Again my dear, your words were a delight to read. Keep up the brilliant work! Security: Why do you have this huge knife in your bag? Me: Martin Yan gave it to me from his signature collection! I’ve only left Vietnam a week ago and I already miss the food so much that I consider going back as soon as possible. The amount of thought and care that goes into these dishes is simply astonishing. I think Vietnam is my favorite culinary country and it’s hard to leave it every single time. We’ve spent the past week strategically planning our meals so we can make each one count. So much good stuff to eat, not enough time! Fabulous selection of pictures which really make the food come alive. It looks like you had a fabulous experience and it is great that you want to maintain your historic family food traditions. I feel it a little strange that you mention Two Fat Ladies. It was announced earlier today that Clarissa Dickson Wright has died. The Guy recently posted..Who Do You Want To Sit Next To On A Plane? Oh, I had no idea about Clarissa Dickson Wright passing on! She must have been getting up there in years, but still sad news. Two Fat Ladies still remains one of my go-to comfort shows; no matter how bad I’m feeling, it always cheers me up! What an amazing day for you – getting to dine on the food of one of your favorite celebrity chefs! I haven’t been able to eat at the restaurants of any famous chefs, but I have been to a couple of food demonstrations at the Toronto Vegetarian Food Fair, one by Chef Roberto Martin (he is Ellen Degeneres and Portia’s private chef and appears on the Ellen show a lot) which was fantastic! Yum!!! What a feast – this all looks incredible. I love food too…nothing better than a great meal. So true! A great meal cures all ills and is really the best medicine for pretty much anything! Steph…color me green! How cool…I remember Yan Can Cook so well, and to be able to see him in person…totally awesome. 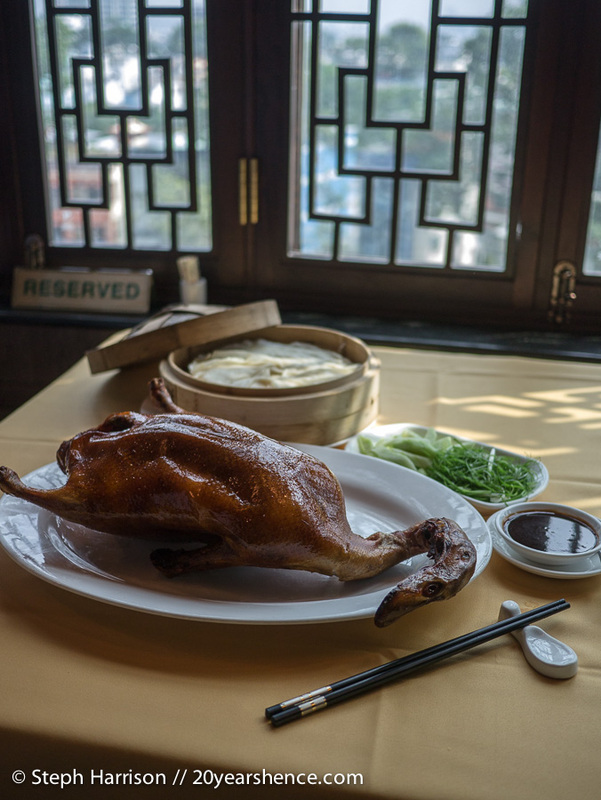 Great food photos…making me hungry, especially for some Peking Duck! Great post! It was definitely one for the history books, I’ll tell you that! It sounds like Yan does a lot of publicity tours these days and he seems to be very gracious and welcoming to all of his fans, so you never know… he might pop up somewhere near you soon! You lucky, lucky girl! That looks like an absolutely incredible feast! James has all kinds of tricks up his sleeves 🙂 I would have been torn about the shark, but also wouldn’t have wanted to offend my host. 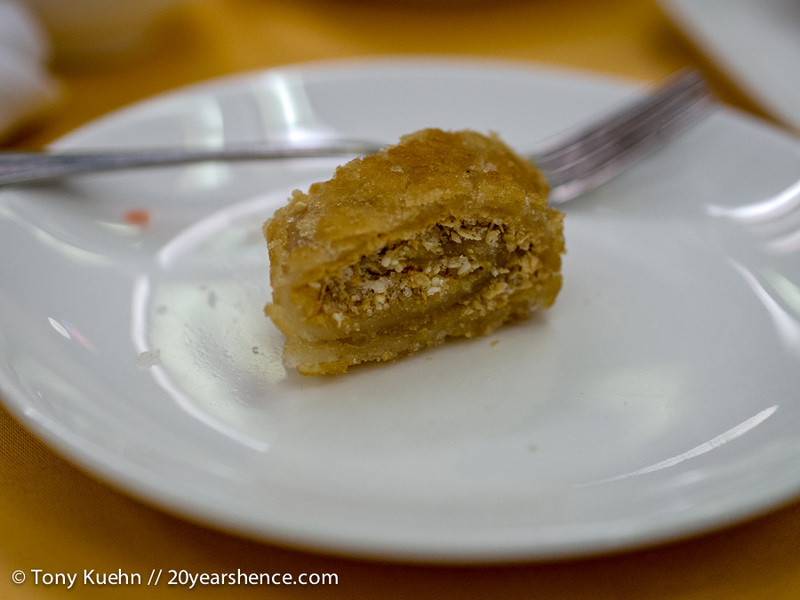 I managed to avoid eating it which is kind of amazing considering I lived in China for two years. I was served whale at a banquet in Japan and couldn’t bring myself to eat it. There was enough going on that I don’t think anyone noticed. I know my abstaining didn’t accomplish anything, but when push came to shove I just couldn’t eat it. Good on you for managing to avoid shark during your stint in China! We were only there for about 3 weeks and it still managed to catch up to us once. If there had been more people at this lunch or it had been a traditional buffet, I would have definitely abstained from the shark just as you did with the whale. I knew that eating it or not eating it really wouldn’t accomplish anything in this situation, but asking a question might, so that’s the route I chose. It can be hard to speak up, especially around people we admire and respect, but I knew it was important for my conscience that I say something! Wow. I can’t imagine meeting one of my childhood cooking show idols. What an experience! I can’t say for sure who would be at the top of my list…I used to watch The Galloping Gourmet with my grandma, too. Of course we also watched Julia Child…I watched a lot of “Great Chefs” so there’s not one chef in particular who I want to meet. As an adult, I’ve been obsessed with Lidia Bastianich, but I think her son is a douche. If I could meet any other chefs from my childhood it would probably be the Two Fat Ladies, but as they’re now both deceased, that meeting would probably be a bit different than I’d care to imagine it! I’d never want to eat anything that they made, but man do they look like they would be a blast to hang out with.